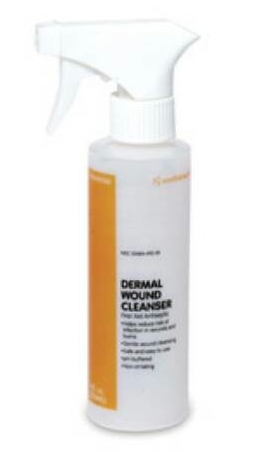 DERMAL WOUND SKIN & WOUND CLEANSER from Smith & Nephew is an over-the-counter, non-toxic, non-irritating, no-rinse, first-aid antiseptic product. It contains the active antimicrobial ingredient Benzethonium Chloride to help prevent bacterial contamination in minor cuts, scrapes and burns. Dermal Wound Cleanser is gentle to skin. It contains Polysorbate 20, a gentle yet effective surfactant that makes cleansing of the skin and wound quick and easy. It is easy to use as the adjustable nozzle trigger-spray bottles that allow the caregiver to gently dislodge wound debris and slough with a direct stream or irrigate the wound with the use of a fine mist spray.